When I think of Weston Ochse, I think of a well respected member of the horror writing community, but then there's this other side of him that has spent 20-plus years serving his country in the U. S. Army, many of them in Army Intelligence. Retired in 2004, he is back in Afghanistan as I write this. Why? I'll let Weston explain in his own words. From a recent Father's Day post on his website at www.westonosche.com, "I chose to come here. I could have stayed home. I had plenty of opportunities. But I wanted to serve my country. I wanted to be that man my father and grandfather showed me how to be. I miss my friends. I miss my family. I miss my wife, even though we talk every day. But I’m here for a season of duty. I’m here to serve. I’m here to build my shadow." So, despite success in the horror genre, it's not surprising that Weston Osche would write about being in a war zone. After all, the best writers write what they know. 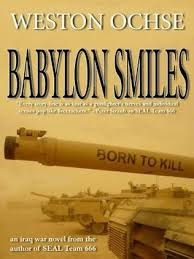 Babylon Smiles is a work of fiction, loosely based on a series of actual headlines during the war in Iraq and the hunt for Saddam Hussein and his weapons of mass destruction. Here's the premise..."From a Federal Reserve Bank in New York to a New Jersey Warehouse to Baghdad, electronic funds seized from the Iraqi government were being converted to actual currency and returned in C-130s. When they landed, the cash was offloaded and disguised as boxes of Meals Ready To Eat-Those high-calorie, bad tasting rations fed to GIs world-wide. Then keeping the lowest of profiles, the millions were loaded onto the back of Army Transport trucks, guarded by privates and supervised by sergeants. So far, by this method, over one billion dollars had been transported in order to refill banks that had been looted. And in the best traditions of Kelly's Heroes and Three Kings, Chief Warrant Officer Rudy Ray Moore and company had determined that they should be allowed to carve their own piece of Iraqi pie." The 399th Transportation Company was a relatively small outfit with the job of vehicle recovery. It was their job to bring in military vehicles that had broken down or been damaged in an attack. The team is made up of a number of what some might consider misfits, but Chief Moore likes his squad just fine. In their quest for the Big Score there are numerous obstacles thrown their way, plenty of dangerous situations, and a lot of twists along the way. Yet, somehow the story comes down to being more about relationships and survival, in a difficult reality, than about any heist. I've said before in this blog that I'm not a fan of combat fiction, but I'm a sucker for a good story and that's what you'll get in Babylon Smiles. 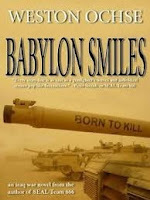 Look for the reveal on the meaning of Babylon Smiles, too. That's kinda cool. Eminent Harvard symbologist Robert Langdon is back, awaking in a hospital bed with no idea of where he is or how he got there. Diagnosed with retrograde amnesia, a threat to his life will propel him and a young doctor, Sienna Brooks, into a frantic chase across Florence, Italy and beyond to find the answers to a puzzle which may, or may not save the world from an unthinkable threat. Sound familiar? Well, if it does, then chances are pretty good that you've read at least one of the previous three Dan Brown novels to feature Robert Langdon. The only reason I didn't give this 5 stars was the overall feeling that I've already been down down this path more than once. If this was the first time reading a Robert Langdon novel, I could easily see myself being more generous. BTW, if you've never read any of the books in the series, it's not necessary to read the other books first. Inferno, works very well as a stand alone work. \Within minutes of opening the book I was once again drawn into Robert Langdon's world. And by the end of chapter two, it was on. Danger. Intrigue. Mystery. And we're off on an insanely fast adventure to solve the clues and potentially save the world. With only a few lines from Dante's dark and epic masterpiece, The Inferno, to guide them, they must decipher a sequence of codes buried deep within some of the most celebrated artifacts of the Renaissance to find the answers to the puzzle they need to solve. Due to his retrograde amnesia, Langdom recalls nothing of the last few days which leads to a particularly embarrassing moment when he finds that Dante's death mask is missing from its exhibit. From the book..."Langdon watched himself on the video as his gloved hand reached out and found the edge of the cabinet door...and then, ever so gently, pulled back until the antique hinge shifted and the door swung slowly open...exposing the Dante death mask. Langdon watched himself in utter disbelief as he reached into the case, gently gripped the Dante's death mask with both hands and lifted it out." As I noted at the start of this review, the Robert Langdon stories have become formulaic and somewhat predictable, but let me also say, "Inferno is an incredibly wild ride." In addition, reading Inferno is a bit like reading a travelogue without the pictures. Brown goes into great detail on the architecture, the art and the history of the places he visits. If you had a mind to, you could Google these places and artifacts as you read and get a more complete picture of his journeys. 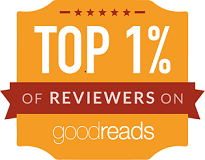 Here's one for you if you've already read Inferno. What would be your transhumanist code name. Mine is FR-2052. 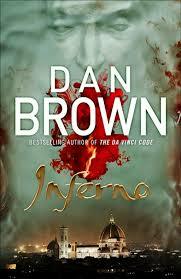 If you're looking for a fun Summer read with lots of twists and very big one at the end, then I'd like to recommend Dan Brown's Inferno. It's like a full season of 24, frightening on multiple levels. Frightening in that it could happen and also frightening in that if something like this doesn't happen we could all be doomed anyway. Just finished this new work from Jeffrey Wilson and my eyes are still a bit teary. Admittedly, I'm a soft touch. I tend to shed a tear when I'm overjoyed and when I'm heartbroken. And, yes, I did turn in my "man card" years ago. When I started to read Fade To Black, I wasn't sure I was going to like it. The action starts in Iraq, with a fire-fight in Fallujah, where men are dying. I just don't care that much for war stories, but that's not what this fantasy tale is all about. It's so much more than a war story. Wilson has created a well balanced tale about a man, Casey Stillman/Jack, caught between two worlds. One were he's dying on the battlefield in Iraq and another where he's a High School biology teacher spending every spare minute with his wife and daughter, Pam and his little Claire "bear". Jack wakes screaming, his hands clutching his throat and his body drenched in sweat. It was all just a dream. Jack is just a HS biology teacher, safe and sound in his own bed. However, the vision he had as he died was vivid and seemed real beyond words. Fade To Black feels, very much, like an extended episode of The Twilight Zone, one of the really good ones. The line between reality and and a dream world is razor thin. Is he a Marine, mortally wounded, dreaming of his family as he lays dying or is he a teacher, living with his family while desperately trying to hold on to what's left of his sanity? Fade To Black kept me guessing to the very end. Just when you think reality is leaning in one direction or the other, there is an ever so slight shift. Just enough to make you rethink everything. This was a little deeper and a bit more philosophical than my usual reading material, but I'm very glad I had the chance to read it. Today is the official release date, so it should now be available everywhere from the fine folks at JournalStone Press. Available in both print and ebook formats. Twice Shy really turned out to be a pleasant surprise. Not a novel I was planning to read, after all it is a YA novel filled with teenage angst and I had quite enough of that with Twilight and it's sequels. But then I got a free copy of it's sequel, Special Dead, being released in Mid-July and I saw JournalStone was running a special on the e-book copy and figured it might be a good idea to read the first book before reading the second. The author, Patrick Freivald does an excellent job of keeping the teen in mind and the book is filled with their styles, their language and their life. The book is packed with the characters you would expect in a novel set in a modern High School. Small-minded administrators, all the usual cliques, bullies, and a new group I had been hearing of, but didn't know much about, emos. For the uninformed, an emo is, well, I suggest you do your own research. It seems the character traits are wide ranging. What one person who is an emo says about what they are differs dramatically from what the next emo has to say about who and what they are. Short answer, they like to dress in dark colors, exhibit traits of depression, but really aren't. They enjoy being called "crazy" and do it for "fun". Ani Romero is in that group, but she uses it as a cover, you see, Ani is dead, sort of. She carries the ZombieVirus. "She didn't know how she'd contacted the virus - it was believed wiped out in North America over a decade before - and she didn't know why it hadn't turned her into a mindless, brain-eating machine. If her mom knew, she wasn't talking. But the other symptoms necrotized flesh, animal psychosis, dulled sense of taste, touch, and smell - those were in full force." Her mom, in addition to being the school nurse, spends much of her time treating her daughter with a series of serums and chemical baths all in an effort to find a cure. Even with all of this there are times of stress and other circumstances which make control of her urges difficult. As the story develops, each reveal is better than the last. This is so much more than a tale of teenage angst with a zombie twist. By the time I got to the final pages I was emotionally drained and when I got to the last page O.M.G. I'm so glad I'll be reading the sequel in a few weeks. If you haven't read "Twice Shy", go get it. A great read for all ages. Read it before the sequel comes out and then get the sequel. Even though it was published in 2012, it's one of the best stories I've read in 2013. JournalStone Books first foray into their new Double Down series is an absolute success. This is where JournalStone puts together a single volume featuring two novellas, one from an established writer and another from a relatively new voice in horror. If this effort is any indication of what to expect in the future, then the future looks so bright I gotta wear shades. 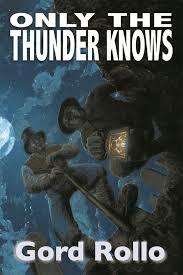 Both stories take known events and extrapolate them into entertaining tales of horror. First up is Only the Thunder Knows from Gord Rollo who was born in St. Andrews, Scotland, and now lives in Ontario, Canada. Fittingly he choose the story of William (Billy) Burke and his friend William Hare who took to bodysnatching in Edinburgh, Scotland as a way to make easy money. They would dig up the recently dead and sell them to Dr. Robert Knox for use in his dissection school. That much is history, but where Gord Rollo takes us from there is wonderful. I enjoyed much of Rollo's prose as he placed me right into the midst of the action, "No, it was the fog he truly despised, the thick Edinburgh pea-soupers that left the cobbles invisible beneath his feet as he trudged along the empty streets." And later, "That was how he liked to think of it - not that the fog came and hid the houses but that it took them away to some distant land where if the sleepers awoke they would see wonders aplenty through their shuttered windows." Aside from being a well written story about the Ressurectionist period in Great Britain, it takes a number of dark twists and turns into the eternal fight between good and evil. No spoilers from me, but I think most readers will will enjoy the twists in this story. 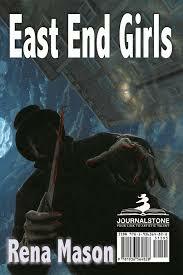 The second novella is East End Girls from newcomer Rena Mason. Rena takes another famous villian from Great Britain's past and weaves a believable tale of Jack the Ripper where Catherine Elizabeth Covington is studying to be a doctor and performing abortions on the street for East End prostitutes. When one of those abortions goes bad Eliza manages to do a fairly convincing Ripper copy-cat. Although, not at all what I expected, I found East End Girls captivating and well realized on the page and I absolutely loved the final twist. Only the Thunder Knows/East End Girls is available now in a Signed, Limited Edition flip book. This is where you read one story and then flip the book over to read the other, and in e-book format as well. JournalStone Books plans another in the Double Down series in September from Lisa Morton and Eric J. Guignard. I'm already looking forward to that one.